Life goes by pretty quick. Just 10 days ago, the Windsor Spitfires were on the ice and goaltender Michael DiPietro was enjoying his home between the pipes. Now, the veteran goaltender is at the other end of the province and the Spitfires are firmly looking towards the future. 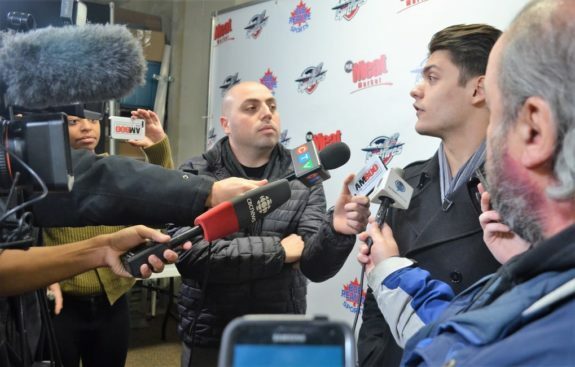 It wasn’t a secret that DiPietro’s time with the Spitfires was running out. The All-Star goaltender, likely the best in franchise history, was a key trading chip and, with the team not in contention, his services would be coveted elsewhere. Last week, general manager Warren Rychel pulled the trigger on a blockbuster deal that sent DiPietro and a pair of draft picks to the Ottawa 67’s. In return, the Spitfires got a handful of high-end picks along with conditional picks and the rights to USHL forward Egor Afanasyev. The result was essentially a passing of the torch, from DiPietro to young Finnish goaltender Kari Piiroinen. It wasn’t an easy move but a necessary one. Now, the Spitfires push forward with Piiroinen and a young, eager roster. Nobody could blame the Spitfires for looking a bit out of it last Thursday and Friday night. Playing a home-and-home series against the Sarnia Sting is never easy and with the trade of a popular and respected teammate, it was an emotional contest. In early November, the Spitfires beat the Sting 5-2 at home behind a 30-save performance from DiPietro. Thursday night, with Piiroinen getting the start, it was clear that an adjustment was needed. Piiroinen made several acrobatic saves and looked poised in net. However, the defence had plenty of holes and the result was five goals against. The Spitfires’ offence was up to the task, with four goals against Sting goaltender Ethan Langevin, but it wasn’t enough. The Sting come away with the 5-4 win in overtime. Unfortunately for the Spitfires, Friday night was much of the same, with turnovers, odd-man rushes and wide-open opportunities for the Sting that led to a 5-1 Spitfires loss. Veteran forward Curtis Douglas had the lone goal for the Spitfires on a goal-mouth scramble. Langevin made 31 saves for the win. Piiroinen allowed four goals on 21 shots through two periods. 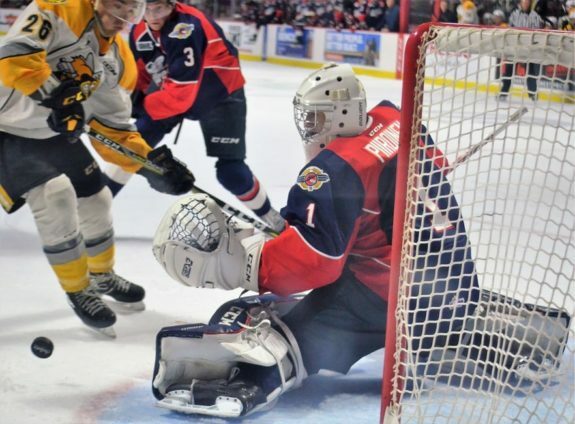 Just after the DiPietro trade, Rychel sent a fourth-round pick in 2022 to the Niagara Ice Dogs for veteran goaltender Colton Incze, who made his debut in Sarnia. Incze allowed one goal on nine shots during his 20-minutes of action in the third period. Make no mistake. These losses weren’t on Piiroinen. Even if you take emotions out of it, the defensive breakdowns and shortened lineup would have tripped up any goaltender, including DiPietro. With last week in the rearview mirror, the focus changes. The Spitfires open up the final weekend before the Christmas break with a home date on Thursday night against the Erie Otters, who beat the Spitfires 5-4 at home earlier this season. 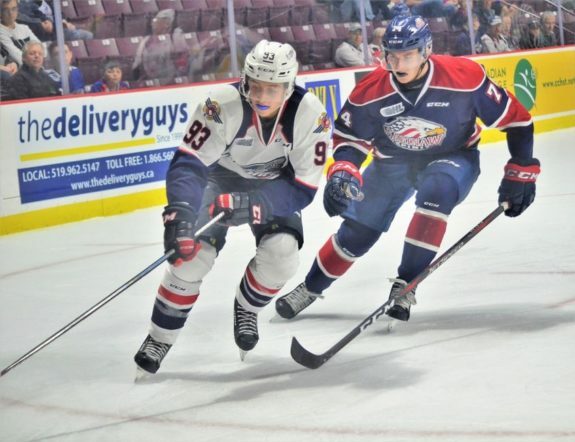 The Spits then hit the road Friday for the opener of a home-and-home with the Saginaw Spirit, finishing up at WFCU Centre on Sunday afternoon. It hasn’t been a fun matchup for the Spirit so far as they’ve lost all three meetings with the Spitfires to date. Sunday is the annual Teddy Bear Toss game with puck drop set for 2 p.m. It’s a long-standing league tradition when fans toss stuffed animals onto the ice following the home team’s first goal. It’s always a treat watching the fur fly from the stands knowing children in the Windsor and Essex County region will have a Merry Christmas. Here are the highlights from the 2017 Teddy Bear Toss against the Otters. Not only is this the last game before the break but also a chance to prove that, while they don’t have their star goaltender behind them anymore, they’re still a force to be reckoned with. When Piiroinen came to the Spitfires from Helsinki in June, he came as a highly-touted prospect for the 2019 NHL Draft. Before DiPietro’s trade, Piiroinen lived up to the hype with a 3.25 goals-against average, .905 save percentage and a shutout. It’s tough for any goaltender to follow in DiPietro’s skates but DiPietro’s mentoring has helped pass the torch. Piiroinen has all the tools to create a great legacy, he just needs the time and patience. A full week of practice with Piiroinen and Incze in net will also help. The Spitfires’ defence is still young with five of seven defencemen 18-years-old or younger, and there will be growing pains. This is where the coaches come into play. If they show confidence in their team’s abilities and adjust systems as required, we know what the defence can do and, while they’ve had some rough nights, stepping up has never been an issue. With the Spitfires having success against the Spirit this season and the Otters in a rebuild, it could be the perfect recipe. With some needed points and confidence heading into the break, they can then go full speed ahead in the second half. With teams likely loading up in the Western Conference following the break – the trade deadline is Jan. 10 – it only gets more challenging. The Spitfires have embraced their young talents to date. Forwards like Will Cuylle, Jean-Luc Foudy and Daniel D’Amico have been a significant part of the team’s success and their increased playing time will be beneficial down the road. By showing confidence in the youngsters, the Spitfires can put them into any situation and know they’ll be just fine. It’s tough to get used to but the post-DiPietro era is underway at the WFCU Centre. While fans have plenty of fond memories of DiPietro, there’s a young group of players eager to create new memories over the next two or three seasons.